Are you excited, Xbox One gamers? The next Halo game could be Halo 5, or Halo 2: Anniversary Edition, or something else entirely, but whatever it is, we'll find out at E3 this year. Microsoft Studios Corporate Vice President Phil Spencer confirmed on Twitter that Halo news will be announced at the Electronic Entertainment Expo in June. "Halo news will be coming at E3," Spender wrote. "343i has a great plan in place, will be cool to share with everyone." Of course, there's also a Halo TV show in the works for Xbox One, but given that Spencer mentioned 343 Industries in his tweet, this likely has to do with the Halo video games. 343 Industries is the studio that took over Halo development from Bungie when the company split with Microsoft to develop what would become Destiny. So far 343 has one main series Halo game, Halo 4, under its belt. Master Chief voice actor Steven Downes previously said that Halo 5 won't arrive until 2015, but there's always a chance that he's not as in the know as he believed when he made that statement. Microsoft confirmed during its E3 2013 presentation discussing the Xbox One that there is a Halo game in the works for the new console, showing a teaser with a poncho-clad Master Chief strolling through the desert but neglecting to mention the upcoming game's name. The most recent game in the series was Halo: Spartan Assault, a third-person shooter that hit multiple platforms in late 2013. 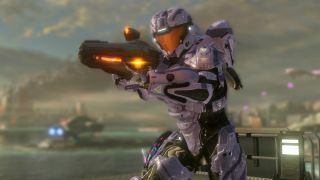 Halo is coming to the Xbox One - here's what TechRadar thought.